Just the thought of pure Maine maple syrup brings to mind years gone by for many of us. Maybe the memory is the steamy aroma of a pot of boiling sap on the kitchen stove, or perhaps a trip to a local sugarhouse for a fresh taste straight from the evaporator, or grandma’s pancakes drizzled with the delicious, all-natural treat. 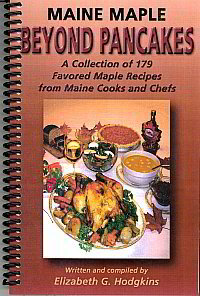 The Maine Maple Producers Association is pleased that Beth has collected recipes from all over Maine and written Maine Maple Beyond Pancakes to help us promote an awareness of our fine maple syrup beyond the walls of our local sugarhouses. You’ll find tantalizing recipes for every setting – the family kitchen, the formal dining room, and the niches of professional cooks and chefs everywhere. Whether you are a first-time user or, like many of us, can’t imagine a meal without maple syrup, you will find new and exciting ways to cook with maple in Maine Maple Beyond Pancakes. Each recipe, several with their own story, has its unique flavor and pleasant aroma. Make these recipes your own, enjoy reading tidbits about our passionate sugarmakers, visit our sugarhouses, and create your own maple stories and traditions. May you delight in using pure Maine maple syrup in your kitchen as much as we enjoy producing it. Harry Schwartz, a former writer of “The Maine Ingredient,” a weekly food column in the Portland Press Herald, has willingly shared some of his Maine maple recipes with me. The following is one of them. This is a hot, soothing drink to sip after exercising in the cold outdoors, during a quiet moment at the end of a busy day, or while relaxing in the evening. In other words, whenever you need soothing. Prepare tea. In separate saucepan heat milk, maple syrup, and vanilla. Stir tea into milk and then pour mixture into mug. Sprinkle with a bit of cinnamon and cloves over top. Coat both sides of meat (pork chops, chicken pieces, ribs) with meat rub and place in oven or on grill to cook. (If baking baby back ribs, bake at 200 degrees for 5 to 6 hours). Submitted by Kristi Brannen of Spring Break Maple and Honey in Smyrna Mills, Maine. Elizabeth (Beth) Gamage Hodgkins grew up on a dairy farm in Augusta, Maine. After graduating from Farmington State Teachers College she taught in Wiscasset, Houlton, and Yarmouth schools, raised three children, and is enjoying seven grandchildren. She and her husband John raise Christmas trees and produce pure Maine maple syrup in Temple. They live in Yarmouth.